Hi all. I registered back in August but just recently got activated. I traded a '76 Chrysler Cordoba for an intense blue 99 R/T regular cab. This is my first Dakota. She's no creampuff, that's for sure. Despite only having 123k, the A/C is missing, the front clip has been replaced, the tailgate has been replaced with one from a 98 R/T, the tonneau cover has no hardware, the trans cooler is gone and the heat only blows thru the defroster(despite working fine the night I drove it home). But so far, I like it. Welcome and good trade from Corinthian Leather to cloth. She'll clean up just fine. Welcome. Any plans with it? Running, driving. I wouldn't have hesitated to drive that car to California. In the 8 years my brother and I had it, we rebuilt the front end, electrical system, cooling system, and installed a 360 Magnum(carbureted), 727 and 8 3/4 3:55 suregrip in place of the stock 360/904/2:45 8 1/4 and leather buckets where the velour was. The body needs some work and paint. I had it up for $2800, then to $2600(roughly the dollar amount I had in it) with no serious offers for a couple months when a young fellow asked if I'd trade. I took a ride in the truck, he drove the 'doba and the deal was done. I also tossed in some parts from another '76 I had, mainly a door and fender to replace the bad ones on the car. A few people have said he made out better but I think we're pretty even, and even if he did, I'm ok with it. I never cared much for that particular car that much and I have several other classics to work on. Welcome! Was the trans cooler removed? Not all R/T’s came with the HD trans cooler from the factory. Can’t tell the brand of tonneau, but it could be a Mopar cover which would be hard to find original hardware for. 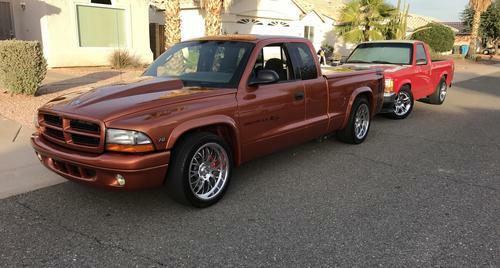 I beleive Mopar sold them in the 98-00 range so that’s my bet without seeing a better photo. Have a pic of the rear of the tonneau? Welcome, the 64 in the background yours also? Yeah, it was removed. A previous owner backed his other truck into the nose and took out the cooler, condenser and radiator along with the hood and grille. He used parts from a V6 truck to repair it. It's a Leer cover. I picked up another cover off Craig's for a quad cab Dak. I'm gonna rob the hardware from it. Gonna hafta 'glass in some mounts but I can make it work. Too bad because the paint is the right color, it's just not long enough. I also have a 69 Coronet, a 66 Fury III and a 64 440 station wagon converted to a 2-door sedan wagon. edit: I left out my 85 D100, was a slant, now a 318/4-speedOD and my GF's 83 Ramcharger 4x4. Nice ride!!! Bonus points for being a Dual Mopar Owner! I'd give my left testy for that polara. I've owned a few of those over the years.